As some of you may have noticed, I have changed my forecast format on the JH Forecast page. After 25-years of doing my own forecast from scratch, starting at 4:00 a.m. each weekday morning, I have decided to take some of the pressure off, so to speak. Not to mention, the huge amount of time it takes, as well as, the stress and frustration that comes with forecasting the weather. What you see now on the JH Forecast page, is similar to what I have used on this page on weekends & during vacation periods. However, the data in this version is more refined. The Forecast info you see initiates from computer models, using the National Digital Forecast Database or NDFD, from the National Weather Service. The NDFD contains a blend of several different models. Versus most other weather forecasts that use only a single model for their forecast display, like the weather app that comes with your smartphone, for instance. This new forecast format from MountainWeather™ uses the NDFD as a base, to start with. I have hand-picked very specific data for the valley and the Teton mountains and then manipulated some of that data. I have made some adjustments to that data to account for deficiencies that I have identified over the last several years of tracking the performance of NDFD data locally. I feel this current format is much better than what was being fed to the site before, on my days off. One major improvement for the summer months, is that the forecast now contains a graph of Thunderstorm/Lightning forecast info (similar to what I had in my own forecast). This was not available in the old NWS version used before. 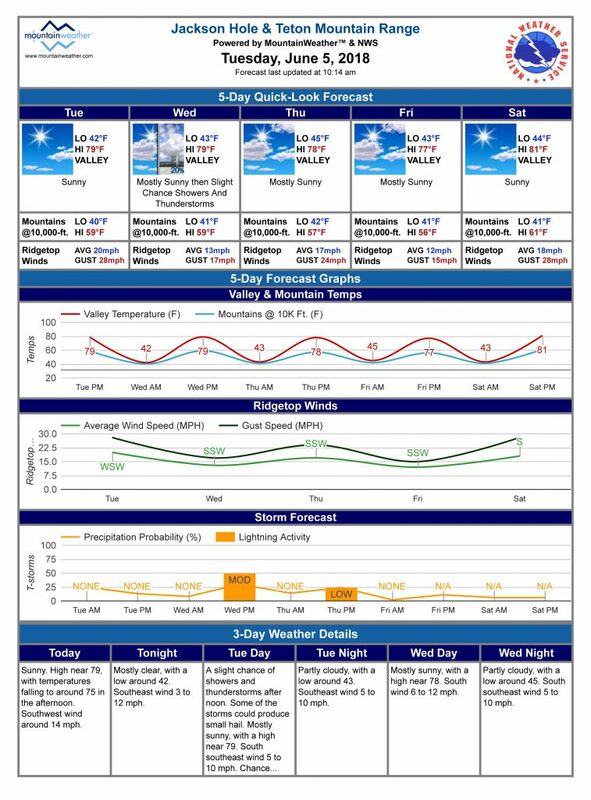 Here is a sample of the new printable version, which puts all the info on to one readable sheet……(available by clicking a button at the bottom of the forecast). 1) Forecast is available in the same format every day of the week. No switching back and forth on weekends, holidays, vacation times, or when I am out of town teaching. 3) Forecasts will now be more consistent, 365 days a year. Some days the forecast will be right, some days it will be wrong. That would true, no matter who is doing the forecast. Something I have learned over the last 25-years! Have no fear, I will still be keeping my hand in what data is being fed into this forecast and making improvements and adjustments as necessary. 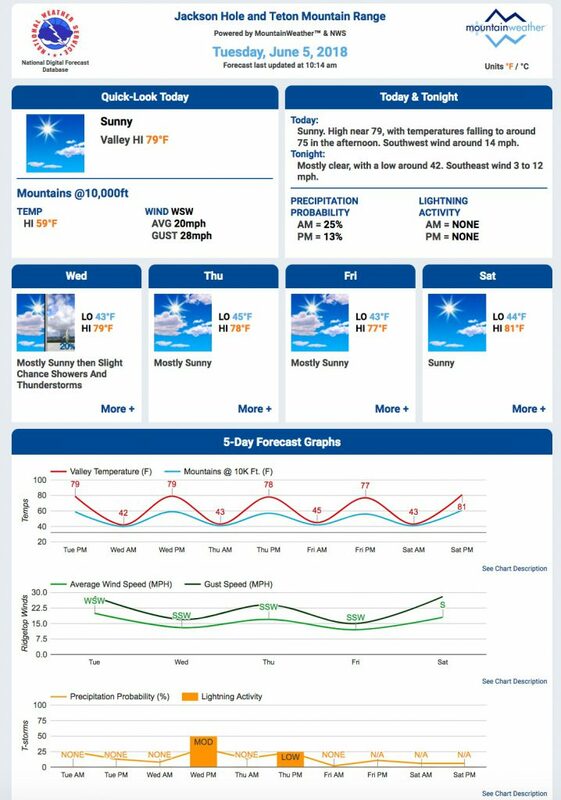 And as far as I know, the JH Forecast on mountainweather.com is still the only place to get a weather forecast for both the Jackson Hole Valley and the Teton Mountains at 10,000-feet, all on one page! Thanks for being fans of the weather for so many years and I hope you’ll continue to utilize MountainWeather as your source for Jackson Hole’s weather, and beyond.